Home » A Rant: Dancing at Roaring Twenties Events: We're Doing it Wrong (and Peabody isn't a thing). This is what generally occurs when organizations care enough to try to provide historically correct music, and have worked to reach out beyond the Swing community; but are dealing with an audience that really isn't clear on what was actually danced at the time (which is most any audience). If there are any “dance lessons” beforehand, they are devoted exclusively to the solo Charleston. The Lindy Hoppers Lindy Hop and spread out all over the floor. Some folks fake it - thinking they're doing it wrong but probably doing it more right than they realize. Most don't look much like those dancers in all those old movies. First I will say, it's not hard to find. It's all there, all over the internet, and in so many of those old movies that are so easy to get these days. We are just too blinded by assumptions, like a sense that the way I was taught a dance today is the way it must have been danced then; or a laser-like focus on Swing and Charleston to the exclusion of all else. Having said that, the answer is deceptively simple: the answer is the Foxtrot. When I say that, your reaction may not be positive. If it isn’t “But I don’t know the Foxtrot”, then it might be “I don’t like the Foxtrot because it’s boring”. 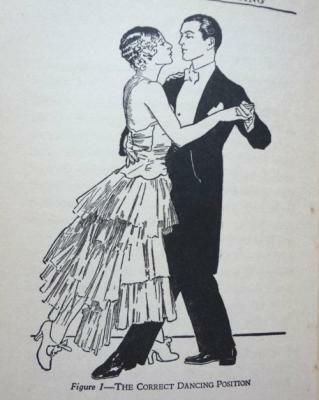 If you do know and like the Foxtrot, you are likely a ballroom dancer, and know a very formalized, structured dance – perhaps danced with partners posed just-so, with faces turned in opposite directions – or you are thinking of what Fred and Ginger were doing. Dances evolve over time. The Foxtrot we do now is not the Fox Trot of the 1920s. I will take a few lines now to talk about the Jazz Age Foxtrot, at the end of which you may well say “No thanks, I’m good”; but if you do that, then at least you will be choosing from a place of knowledge rather than ignorance. On the dance floor, every dancer is free to say “I know what I’m supposed to do, but I don’t wanna” – and while the end result might be the same, I think is superior to doing the wrong thing because you think it’s right. The first thing to know about the Jazz Age Foxtrot was that the hold did not use a frame with dynamic tension, but rather the dancers were body-to-body, and the lead was from the leader’s upper body, his core. This meant that the dance could be very spontaneous, with the follower just going with the flow rather than looking for cues to launch into her next routine. The second thing to know is that the basic step was just walking. If you stepped on every beat, it was “quick” time and if you stepped on every other beat is was “slow” time, you could do one or the other or a combination of the two – but the essence was walking to the music. This was the default setting for all dancing. It was the universally understood foundation that would allow a man from Paris to dance with a woman from New York; or a man from London to dance with a woman from Shanghai; and never worry about the fact they didn’t have the same teachers or know the same routines. He leads, she follows, they dance. The third thing to know is that it was infinitely variable. Having settled on a basic framework, the dancers of the time changed their style to suit the music and spiced things up with any number of complex steps (anything the Lead could lead and the Follow could follow was fair game) to include Charleston – either with your partner or interrupting your Foxtrot for some solo hijinks. Yes, Charleston is a Foxtrot variation. Balboa and Shag are also very clearly youthful riffs on the basic Foxtrot foundation, as is Lindy. It was also the foundation of scores of variations like the Baltimore, Sugar Step, Crawl Charleston, Blue-Trot, Collegiate etc. etc. The basic walk step had been the “One-Step”, but the One-Step was rebranded the Foxtrot in the late teens without actually changing anything. The Two-Step is also a Foxtrot option, as are any number of other combinations, to include the familiar "slow-quick" mixes. Because of this infinite variability, Jazz Age Foxtrot is not like any other dance. It doesn’t fit into a clean definition. It is not equal in importance to other dances – it is dancing boiled down to its essence, and it is the starting point for anything you can think of in 4-4 time. It refuses to go into the little box that modern dancers want to put it in. Just look at the sheet music and records of the time. Almost all dance music, be it fast, Jazzy, slow, bluesy and in between, is "Fox Trot". The 2-4 Tango and 3-4 Waltz, which were still danced at the time, though not as commonly, especially among the young as the Foxtrot. They did however, in their Jazz Age forms, have much in common with Foxtrot of the time. I will occasionally hear people talk about how they do the “Peabody” which was supposedly this popular dance in the ‘20s - with a sense that if you weren't doing the Charleston, you must have been doing the Peabody. Wikipedia tells me that the Peabody was named after a really fat Police detective who needed to dance in open position, not face to face, to make room for his big belly. I don’t dispute the “origin story” (maybe it's true, maybe it isn't), what I do dispute is the assertion that when you see people in the ‘20s dancing a Jazzy Foxtrot that doesn’t look like the Foxtrot you’ve been taught, they are dancing the Peabody. Something I have not seen in all my research is a single reference to “the Peabody” in any visual source older than a 1950s Honeymooners episode or written source before a 1936 (not '20s) dance book citation. I have not seen it in any of the dance books or literature of the '20s (which are FULL of Foxtrot) or any films of the time (also full of Foxtrot). So I am willing to concede that maybe people might have been dancing something called a "Peabody", perhaps in New York, but the term does not seem to have made the “big time” during the Twenties. If it had been as big a deal as its proponents seem to think, it would have left a much bigger "footprint" in the documentation. From everything I have been able to determine about the dance of the Twenties, the Peabody was not “a thing” and what people today call the Peabody is just another Foxtrot. So, to make a long story just a bit longer, the historically correct dances of the 1920s aren’t hard to find. They are all over YouTube and in all those old movies you watch. You just have to open your eyes and there they are (and I’ll warrant you’ll find that Charleston is not what they’re doing in anything like a majority of the scenes). It’s incredibly easy to do a historically correct 1920s dance. In an era when almost everyone danced, they did a dance almost anyone could do. Just stand up, take your partner and move to the music. If you want to get fancy, get fancy, but don’t feel like you have to. So, this concludes my rant. If you’ve made it this far and looked at the video and said, “Hey, that could be fun, I’ll give it a try” that would be awesome. If you look at it and say “Nah, I’ll keep doing what I’m doing”; from the historian’s viewpoint that’s not as awesome, but at least you’re making an informed decision, and really, in the end, dancing is supposed to be fun. I’ve written A LOT about this. If you want to know more, or before you start telling me how I've gotten it all wrong, please have a look at my website. And here's a collection of videos I've uploaded that I have tagged "Foxtrot"
Since I posted this, I have been provided with a clear citation that proves the existence of the Peabody: "Popular ballroom dances : including Westchester, tango, waltz, riviera, peabody, collegiate swing." by Thomas E Parson 1936 or 1937. However, all this tells me is that there was a dance called "Peabody" that was popular in 1936 (not the 1920s) but did not remain popular long enough to be included in Mr. Parson's next work (1937) "Popular ballroom dances, including rumba, big apple, modern waltz, collegiate shag, Parisian tango, Manhattan strut, conservative fox-trot, beginner's fundamentals" or any of his numerous later works. I have also been provided with an unambiguous mention of the "Peabody One-Step" in a newspaper in 1915, so it clearly has some history behind it.